As the end of another semester nears, I’m finding the summer sunshine warming my imagination far more than it is my desire to type papers indoors on my laptop or sit still inside for three hour long classes, 4 out of the 5 mornings of my week. I have a long list of assignments, papers, projects, iMovies and lesson plans that I need to be working on and yet, I can’t get myself motivated, inspired, excited about doing any of it. I keep telling myself – only three more weeks – only three weeks to buckle down and then, then it’s all over. And yet, for the last several beautiful days, three weeks of this seems miserable and impossible. If college is going to teach me anything over the next three weeks, it’s just going to be more of the same on the art of beautifully bullcraping – turning two paragraphs into four pages – inserting “heart” in between the spaces to impress my teachers. If I’m lucky, I’ll surprise myself in the next three weeks and actually learn far more than I ever dreamed of – yeah, about that. If I’m lucky, the fake “heart” I’m forcing to fit between the lines will actually manifest itself into something real and I’ll actually find something I’m passionate about – however, I’m not holding my breath. While I hope, and am in fact praying that these things do happen, right now I’m banking on the next three weeks of my school life progressing in a more painful, slow and monotonous like manner – where the only real heart and inspiration in my life is that which I’ll be force feeding myself, in hopes of creating some creativity and imagination in the other, absolutely dull realms of my world. Thus, begins today’s blog. The video of his Commencement address is seriously worth watching. The actual text of the Commencement address is below. Again, you can’t connect the dots looking forward; you can only connect them looking backwards. So you have to trust that the dots will somehow connect in your future. You have to trust in something — your gut, destiny, life, karma, whatever. Because believing that the dots will connect down the road will give you the confidence to follow your heart. Even when it leads you off the well worn path, and that will make all the difference. I’m pretty sure none of this would have happened if I hadn’t been fired from Apple. It was awful tasting medicine, but I guess the patient needed it. Sometimes life hits you in the head with a brick. Don’t lose faith. I’m convinced that the only thing that kept me going was that I loved what I did. You’ve got to find what you love. And that is as true for your work as it is for your lovers. Your work is going to fill a large part of your life, and the only way to be truly satisfied is to do what you believe is great work. And the only way to do great work is to love what you do. If you haven’t found it yet, keep looking. Don’t settle. As with all matters of the heart, you’ll know when you find it. And, like any great relationship, it just gets better and better as the years roll on. So keep looking until you find it. Don’t settle. Wow. What Does Your Blog Say About You? As I was spending some time assessing my own blog my previous post, I started to think about the type(s) of personalities that would enjoy blogging, and wondering how much one’s personality is reflected in their blog. As I mentioned in my previous post, I have found in blogging true enjoyment and an outlet for myself to collect and gather, write, document, organize and share the hours I spend creatively researching a topic or interest (such as this one). However, blogging can’t possibly be enjoyable for everyone. In society where technology is everywhere and universities especially are promoting their education students to learn blogging, I found myself wondering how much it should be pushed, if it is for everyone, and how much we should or can compare or “grade” students on blogging when it may be seen as enjoyable and useful for some, and as simply annoying and frustrating for others. Since this was an area that I know relatively nothing about, beside my own experience(s), I went to the research for some answers. You all read blogs, and many of you write them, too. But what sort of person writes a blog? Are there particular personality traits that make certain people more likely to write a blog? If so, what are those personality traits? Do you have them, too? A team of scientists, led by psychologist Rosanna Guadagno from the University of Alabama, wondered what personality traits made some people more likely than others to write blogs. To answer these questions, Guadagno and her colleagues used the Big Five personality inventory test to measure five key personality traits in college students who write blogs. The Big Five personality traits are five broad personality factors that had been discovered throughout repeated psychological research during the middle of the twentieth century. As agreed by the professionals in the field, these Big Five factors are Openness to new experiences, Conscientiousness, Extraversion, Agreeableness, and Neuroticism (OCEAN) and each comprises a cluster of more specific personality traits that correlate together. For example, Neuroticism includes such related qualities as a tendency to experience unpleasant emotions easily and is sometimes referred to as emotional instability. One of the Big Five qualities, Openness — which comprises an appreciation for art, emotion, adventure, unusual ideas, imagination, curiosity, and variety of experiences — is still widely discussed in the literature, where it is often referred to as “intellect.” Nevertheless, despite some discussion among the experts as to how to define the subtle nuances of these five qualities, research shows that they become stable measurable personality qualities in humans after they’ve reached adulthood. So how do these personality traits correlate to blog writing? To answer these questions, Guadagno and her team surveyed more than 300 college students from the University of Alabama and Southeastern University about their blog writing and reading habits and had them all complete the Big Five Personality Inventory test. According to their results, Guadagno’s team found that high scores for two of the Big Five qualities strongly predicted blog writing activity: Openness to new experience and Neuroticism. Considering that blog writing and reading is a new activity that was mostly unheard of even five years ago, Openness to new experiences is a logical prerequisite for adopting in this behavior. High Neuroticism is also not a surprising finding, since even bloggers refer to writing about personal experiences as “navel gazing” — neurotic behavior. Guadagno’s team also found some gender differences. For example, women with a high Neuroticism score who were also lonely were more likely to write a blog, while this was not the case among men who write blogs. Like all good studies, this one suggests a large number and variety of questions that are worth investigating: for example, it would be instructive to examine the content of blogs to determine whether they reflect aspects of an individual’s personality; whether a blog writer’s word choice predicts their ability to cope with traumatic events; and especially, to learn more about why people write blogs (coping, reaching out for social support, etc.)? Personally, I am curious to know if certain types of blogs are predicted by particular personality traits, for example, are blogs about science or about one’s career predicted by a different group of personality traits than blogs about dating or one’s personal life? Additionally, Guadagno cautions that her team’s results may not be more widely applicable beyond her sample group: American college students, an age group whose Big Five personality traits are still undergoing some changes. But she reminds us that understanding blog writing is a worthwhile goal. • The Barber – Barbers can prove to be prominent citizens— they know the right people, have lots of wisdom from years of listening to customers, and have no problem sharing that wisdom. In some ways, a barber serves as a pundit or analyst, or perhaps an adviser. The barber deserves to be heard not only because she sees things differently, but often because she’s right. • The Blacksmith – The blacksmith is like the barber in that he knows the industry, except he is typically inside a company and is thus hammering industry and opinion through the company forge. Software developers at IBM, Sun, and other large technology companies fulfill this role as they bring their experience to bear on a problem. • The Bridge – A bridge blogger is a person who makes connections, influences, and helps bring people together. She is obsessed with relationships and connecting people, and as a result she can often function as a peacekeeper. In a corporate setting, the public relations professional may be a natural bridge blogger—or it could just as easily be the company secretary. • The Window – A window blogger is similar to a blacksmith blogger in that he typically works inside a company and uses his experience to frame his opinions. The difference between the two types, though, is that a blacksmith blogger typically talks about things inside the company, while a window blogger typically talks about things inside and outside the company. • The Signpost – A signpost blogger in unusual in that she typically doesn’t share her opinions—at least that isn’t the primary reason for her blog’s existence. A signpost blogger points out cool things of interest in her industry. She may not have much to say in each post (maybe only a few words describing a topic of interest), but she may post dozens of short notes per day as she comes across interesting tidbits, perhaps pointing readers to information at other sites. • The Pub – Pub bloggers create discussions designed to bring in people from all spectrums of a particular issue to talk something through and have a laugh at themselves or others in the process. Peter Davidson’s blog is a solid pub blog example; “Thinking by Peter Davidson” (http://peterthink .blogs.com/thinking, allows a group of likeminded thinkers to explore a variety of issues. • The Newspaper – A newspaper blogger functions in many ways like a journalist—attempting to do more reporting than opining, she does her best to stick to the facts. Many political blogs are newspaper-ish in nature, as are a few technical blogs, such as Engadget (www.engadget.com), which focuses on the latest “gadgety” news. A single blog may often include characteristics of several of these types; however, because blogs are generally written by one blogger or a small group of bloggers, you can often see an overriding trend as to what type of blogger is at work. Mixed in with these broad areas are other types of blogs that make up the blogospherical town—the post office, where people go for a large variety of information; the town hall, where important decisions are made; and all sorts of other oddities. A healthy town needs all types of citizens and places, and there are certainly more than enough uses for blogs to go around. According to the above descriptions, I am a blend of the newspaper blogger and the signpost blogger. In what is described as the blogospherical town, I am a little bit journalist and a little bit signpost. To tie in with my previous blog on self-assessment – While I mostly report my findings and research in paragraph, quote or fact-like form, I also attempt to point out cool things of interest in the worlds of education, the arts and technology. I like to report back and share interesting things that I’ve found, bolding my favorite parts, but also suggesting readers research more on their own. I try not to offer everything in my blog, but I also understand that in this hectic life we sometimes cannot find time to click on even a link, much less watch a twenty-minute TED presentation – so, in a very journalistic fashion, I offer to readers an overview and quick summary of my favorite parts and pieces. Just as many different types and personalities of people are found in a town, there are also many different types of blogs. A person’s personality in reality will largely influence the type and style of blog they create. Because of this – because it is a more creative and free-form of expression compared to writing an essay or answering a prompt – how can we compare blogs and/or grade them. As a future teacher, these have been some of the questions on my mind, and ones that have not been entirely answered. As I’ve gone through the process of making this blog for a class, and designing how it would be graded as a class, I’ve learned a great deal – and yet, there are still unanswered questions and entirely unclear areas. As a creative and freer form of expression, I think there always will be. And as the ScienceBlogs article points out, there is still much research to be done in this area. The Riley Guide defines self-assessment as, “a process by which you learn more about yourself — what you like, what you don’t like, and how you tend to react to certain situations.” After almost three months of blogging, I’ve certainly gained a better understanding of what I like and don’t like – and what concepts in the worlds of education, arts, and technology interest me the most and the least. The professor who gave me the initiative to first create this blog commented on one of my earliest posts, that blogging could be “the ideal creative vehicle” for me. And honestly, blogging has become this for me. Blogging has allowed me to combine my love for research with my love for writing and creative ideas, and gather the information I learn and enjoy in an organized fashion. I’ve learned a great deal through the writing and research that I’ve done specifically for this blog – along with constantly learning from other’s blogs and from the comments and conversations I’ve had from my blogs (and theirs). As much as I’ve been keeping up with my blog because I knew my professor and fellow classmates would be reading it, I’ve also (and mostly) been keeping up with it out of my own desire to research, learn, gather, organize and write about the topics that interest me. And this enjoyment and excitement that I would say I find in blogging is one of the main factors that allows me to give myself an A in my overall assessment of my own blog. However, this is my one bit of a disclaimer before entering into my self-assessment: I invested the time I did into my blog for myself, my own enjoyment and my own creative interests, far more than I did for any external forces or reasons (professors, class mates, grades etc). Jesse North wrote in her most recent post, “In a way I feel like I’m posting an inner-most secret of mine all over my blog by doing this, but alas, it must be done. Here goes nothing!” I must say that I completely understand her here, and will admit that it’s taken me the entire week to mentally accept giving these statistics away. It was not until I reasoned and came to the conclusion that this way the easiest way to share these things with my professor, that I am finally writing this. 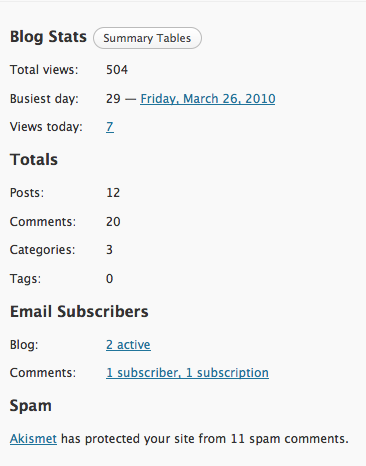 Statistically speaking, as of 11:50am on April 6 (today) I’ve had 504 total views of my blog, and 29 on the busiest day, March 26, 2010. You can see this in the chart(s) below – along with the Stats breaking my blog views into per day, per week and per month. In her blog on self-assessment, Jessie Bindrim wrote, “Now here’s the zinger of the self assessment, quality. More specifically, what makes a quality post?” Besides my first one or two posts, I feel that the majority of my posts were of a high quality and rather lengthy. Rather than writing many short posts, I found more satisfaction in writing deeper and longer posts only once or twice a week, but packing them with several hours of research and information. As mentioned in my first two paragraphs of this post, my self-discipline over the last three months has been what I consider excellent, due to the enjoyment, feelings of accomplishment, amount learned etc. I’ve received from working with my blog. I’ve written almost one blog per week. Although I seem to have missed writing a post for two weeks (not in a row), I made up for those weeks by writing two and three posts some weeks.Those posts that stand out to me, were either the ones that generated the most or best comments, or the ones that i enjoyed writing the most: Writing out of the blog rut, Teachers and/or technology and Storytelling supports learning, imagination, and creativity. My previous blog, Creativity, education, and the future was one of my most enjoyable posts to write so far in terms of research and information, however, it has not generated near as many comments or hits as some of my other posts. In regards to the conversations and comments that I received and were generated from my twelve blog posts so far, I had several extremely exciting comments. 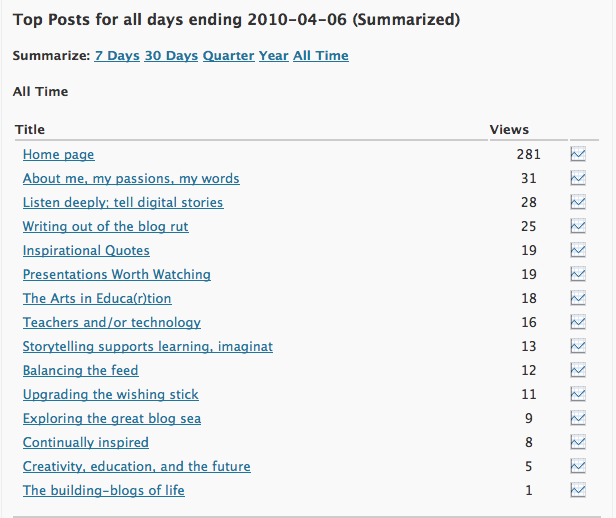 On the busiest day in my blog’s history, March 26th Tim Ereneta, a storyteller from California, commented on my blog in regards to my post Storytelling supports learning, imagination, and creativity. After mentioning Ereneta in this blog, he left an encouraging and insightful comment. And then, there March 16th, the day Jeff Utecht (author of the blog, The Thinking Stick and educator, consultant and presenter) left a comment on my post all the way from the International School Bangkok and left me starstruck all day (and week, and month). If this was not the highlight of my life thus far, it was certainly the highlight of my blog-life. Note: The names and blogs above are not linked in hopes of preventing pingbacks and thus, Jeff Utecht from ever reading this. As for the other 18 comments, while none left me as enchanted as the one mentioned above, all of the others, left by my classmates and professor were greatly appreciated, often helpful and wonderful. Overall, with the amount of time I’ve been putting into the research and writing of my blogs, I am extremely satisfied with my blog. Time is currently the biggest hurdle in allowing or not allowing me to further improve and advance my blog. While I would most like to improve on commenting on other’s blogs, I am very pleased with my own and would be content with it, if I was able to keep it to the level it has been over the past three months, for the next four weeks. I have created what I believe to be a solid PLN, and have developed skills that I will surely take with me into both my career and student teaching, and into simply life. Also, instead of seeing this blog just in terms of this semester – four more weeks – I have begun to think about this blog in terms of much more. When time is finally on my side and my junior year is over, I plan to continue developing this blog and my research, and using it as a way to organize my findings of topics perhaps beyond education and technology. Though I think I deserve an A for my blog, there is of course room for both improvement and for more researching, writing and learning. Also, once I realized how much I gained from and enjoyed blogging, this blog quickly became not about the grade. Blogging has indeed become “the ideal creative vehicle” for me, and I plan to continue learning and writing along the blogging road. This morning I’ve found myself surrounded by books and spring sunlight, nurturing myself and learning more on the fascinating topic of “creativity.” I took the time to watch a TED talk this morning that’s been on my list to watch for quite a while now, and it was absolutley worth it. “I have a big interest in education, and I think we all do. We have a huge vested interest in it, partly because it’s education that’s meant to take us into this future that we can’t grasp. If you think of it, children starting school this year will be retiring in 2065. Nobody has a clue — despite all the expertise that’s been on parade for the past four days — what the world will look like in five years’ time. And yet we’re meant to be educating them for it. So the unpredictability, I think, is extraordinary. … So I want to talk about education and I want to talk about creativity. My contention is that creativity now is as important in education as literacy, and we should treat it with the same status. What these things have in common is that kids will take a chance. If they don’t know, they’ll have a go. Am I right? They’re not frightened of being wrong. Now, I don’t mean to say that being wrong is the same thing as being creative. What we do know is, if you’re not prepared to be wrong, you’ll never come up with anything original. If you’re not prepared to be wrong. And by the time they get to be adults, most kids have lost that capacity. They have become frightened of being wrong. And we run our companies like this, by the way. We stigmatize mistakes. And we’re now running national education systems where mistakes are the worst thing you can make. And the result is that we are educating people out of their creative capacities. Picasso once said this. He said that all children are born artists. The problem is to remain an artist as we grow up. I believe this passionately, that we don’t grow into creativity, we grow out of it. Or rather, we get educated out if it. So why is this? But something strikes you when you move to America and when you travel around the world: Every education system on earth has the same hierarchy of subjects. Every one. Doesn’t matter where you go. You’d think it would be otherwise, but it isn’t. At the top are mathematics and languages, then the humanities, and the bottom are the arts. Everywhere on Earth. And in pretty much every system too, there’s a hierarchy within the arts. Art and music are normally given a higher status in schools than drama and dance. There isn’t an education system on the planet that teaches dance every day to children the way we teach them mathematics. Why? Why not? I think this is rather important. I think math is very important, but so is dance. Children dance all the time if they’re allowed to, we all do. We all have bodies, don’t we?… Truthfully, what happens is, as children grow up, we start to educate them progressively from the waist up. And then we focus on their heads. And slightly to one side. If you were to visit education, as an alien, and say “What’s it for, public education?” I think you’d have to conclude — if you look at the output, who really succeeds by this, who does everything that they should, who gets all the brownie points, who are the winners — I think you’d have to conclude the whole purpose of public education throughout the world is to produce university professors. Isn’t it? They’re the people who come out the top. And I used to be one, so there. And I like university professors, but you know, we shouldn’t hold them up as the high-water mark of all human achievement. They’re just a form of life, another form of life. But they’re rather curious, and I say this out of affection for them. There’s something curious about professors in my experience — not all of them, but typically — they live in their heads. They live up there, and slightly to one side. They’re disembodied, you know, in a kind of literal way. Now our education system is predicated on the idea of academic ability. And there’s a reason. The whole system was invented — around the world, there were no public systems of education, really, before the 19th century. They all came into being to meet the needs of industrialism. So the hierarchy is rooted on two ideas. Number one, that the most useful subjects for work are at the top. So you were probably steered benignly away from things at school when you were a kid, things you liked, on the grounds that you would never get a job doing that. Is that right? Don’t do music, you’re not going to be a musician; don’t do art, you won’t be an artist. Benign advice — now, profoundly mistaken. The whole world is engulfed in a revolution. And the second is academic ability, which has really come to dominate our view of intelligence, because the universities designed the system in their image. If you think of it, the whole system of public education around the world is a protracted process of university entrance. And the consequence is that many highly talented, brilliant, creative people think they’re not, because the thing they were good at at school wasn’t valued, or was actually stigmatized. And I think we can’t afford to go on that way. In the next 30 years, according to UNESCO, more people worldwide will be graduating through education than since the beginning of history. More people, and it’s the combination of all the things we’ve talked about — technology and its transformation effect on work, and demography and the huge explosion in population. Suddenly, degrees aren’t worth anything. Isn’t that true?… But now kids with degrees are often heading home to carry on playing video games, because you need an MA where the previous job required a BA, and now you need a PhD for the other. It’s a process of academic inflation. And it indicates the whole structure of education is shifting beneath our feet. We need to radically rethink our view of intelligence. We know three things about intelligence. One, it’s diverse. We think about the world in all the ways that we experience it. We think visually, we think in sound, we think kinesthetically. We think in abstract terms, we think in movement. Secondly, intelligence is dynamic. If you look at the interactions of a human brain, as we heard yesterday from a number of presentations, intelligence is wonderfully interactive. The brain isn’t divided into compartments. In fact, creativity — which I define as the process of having original ideas that have value — more often than not comes about through the interaction of different disciplinary ways of seeing things... And the third thing about intelligence is, it’s distinct. I’m doing a new book at the moment called “Epiphany,” which is based on a series of interviews with people about how they discovered their talent. I’m fascinated by how people got to be there. I believe our only hope for the future is to adopt a new conception of human ecology, one in which we start to reconstitute our conception of the richness of human capacity. Our education system has mined our minds in the way that we strip-mine the earth: for a particular commodity. And for the future, it won’t serve us. We have to rethink the fundamental principles on which we’re educating our children. There was a wonderful quote by Jonas Salk, who said, “If all the insects were to disappear from the earth, within 50 years all life on Earth would end. If all human beings disappeared from the earth, within 50 years all forms of life would flourish.” And he’s right. To learn more about Ken Robinson and creativity, Robinson has written a book called “Out of Our Minds: Learning to be Creative,” that asks questions such as “Why is it essential to promote creativity? Why is this so important? What’s the problem? Why do so many adults think they’re not very creative (and not very intelligent)? How do we lose the confidence to be creative?What should be done? Is everyone creative or just a select few? Can creativity be developed? If so, how?” I haven’t read it yet, but it is officially in my cart on Amazon and should be a wonderful read for this summer. In 1998, Robinson also “led a national commission on creativity, education and the economy for the UK Government bringing together leading business people, scientists, artists and educators. His report, All Our Futures: Creativity, Culture and Education (The Robinson Report) was published to huge acclaim.” This report can be found for free on his website, along with descriptions of the other books and articles that Robinson has written, live interviews and presentations of/with Robinson that have been recorded over the years, links and so much more. His website is quite fun, interactive, bright and helpful. Check it out! Tonight I saw Maya Angelou speak – and in that hour that she sat before a black curtain wearing a beautiful black dress, she sang and read and laughed and smiled. But mostly, she talked about three things (at least, these are the three things I heard most) – in that hour she talked a great deal about teaching, poetry, and storytelling. She talked about the importance of the first two, and talked about them through stories of her own life. I’ve been working on this particular blog for several days now, never finding the time to finish it, but I came home tonight inspired and thankful that I hadn’t finished it, because there was so much more that I wanted to say. Tonight was yet another learning experience that reminded how much the learning process is never over, and how much there actually is out there to learn. And while that thought is mostly overwhelming, it’s also really exciting. This spring, creativity and imagination have been everywhere around me: in novels and movies, and on the stage. Spring break, my experiences ranged from reading Mister Pip, a novel by Lloyd Jones for an adolescent literature education class, to watching The Imaginarium of Dr. Parnassus and Finding Neverland, (both of which have Johnny Depp in) to seeing performances of both Les Miserables and A Chorus Line on stage. In his article, A Better Way to Education through Storytelling!, Indiana Bones writes: “Storytelling can be an incredible teaching tool. In the classroom, the role of storytelling can go far beyond the acquisition of literature. I believe this is due to the additional emotional content that can be delivered through a story. Information that is then even more thoroughly retained, because the input of facts is received on an emotional as well as an intellectual level, this allows for the new information to be stored in a much deeper part of the memory within the human brain. Because of this often overlooked fact, I feel that oral storytelling should be considered one of the better ways to educate and teach information. It can be used in all aspects of learning if applied properly. Telling stories, reading and writing all work together to better communicate the lesson. By weaving storytelling into the curriculum, Educators can tap into a deep need in the human spirit, to receive information through stories and emotion… Due to this neurological emotional imprinting, storytelling can be a powerful classroom addition. It supports speaking and listening skills, motivates reading and writing, stimulates the imagination and develops and enhances students’ response to literature, history, social studies and many other components of the curriculum. Storytelling in the educational setting is arguably one of the most effective teaching tool we have. Stories can teach, reinforce and introduce curriculum in the most logical and creative fashion imaginable. Almost any subject matter can be presented or introduced in story form. Storytelling can also entice students to strive for greater academic achievement. As a storyteller I have been hired on numerous occasions as an incentive to encourage students to read in state wide completion such as the “Battle of the Books” and as a reward for those who have succeeded in reaching academic excellence, reading goals or other successful educational hallmarks. Only once have I ever had a teacher, a professor, who I could describe as a storyteller. He seldom came to class with even a bag much less a notebook, and if he ever had an actual agenda, I wouldn’t know; but just as we always came to class, so did he with a desire to discuss the books we were reading and a thousand stories about those books, and their authors and their author’s wives and the cities he’s lived in and the cities the authors had lived in and the food they did or did not eat and the things their wives said. And while there was not even one exam for this class – only a journal we were required to write in each week and a final paper on a book of our choice for a final grade – I remember more from that class than I do any other English or literature course I’ve ever taken in college. This professor taught me a great deal through storytelling and about the power and importance of storytelling. Maya Angelou reminded me of this power tonight. In an article written by Wendy Haight, featured in School Talk, entitled Stories as Tools for Teaching: Lessons from Sunday School at an African American Church, Haight sites ways in which storytelling supports learning: “Storytelling helps to accomplish educational goals. When asked how they accomplish their educational goals in Sunday school, adults at First Baptist Church discussed stories as an important activity. Pastor Daniels explained: “We are convinced that it is out of life that the best applications of any kind of principles can be found. And, certainly, if you’re going to make sense of it, you have to relate it to life. When we tell our own personal stories, there’s almost an immediate connection with the youngsters” (Haight 2002, pp. 82-83). One wonderful resource I found is Storyteller.net. This website offers hundreds of free articles on the benefits of storytelling, along with wonderful storytelling stories and examples. It also has a Find Tellers tab which allows you to find storytellers in your area (in Pennsylvania there are seven registered storytellers), and an “Amphitheater” tab which features podcasts on storytelling! ” In the most recent Amphitheater podcast, Sean Buvala is doing “one of his favorite things to do, and that is to talk to people who are working storytellers, exploring the art form in their own places.” Awesome, right? He interviews Tim Ereneta, a storyteller from California – and if you get a chance to listen to all four parts of the podcast, part two, on theater, is my favorite. You are passionate about something whether teaching, technology, your kids or your car. Be passionate and writing is easy. If your not passionate about the post, or idea, you’ll know cause you just won’t do it. This makes it hard when a teacher (like me) asks you to blog about something you might not be passionate about. That makes blogging an assignment….not real blogging. Real blogging is about you….about your thoughts, your feelings, your ideas…..the blogging you do for classroom, is just classwork. At least two or three times a day I think to myself “that’s a blog topic” and for a while I would sit down to write a blog post and not be able to remember what it was that spurred that moments thought. So I’ve started writing blog topic ideas down. I use the stickies app on my MacBook and Google Tasks via a Chrome extension that lets me quickly jot down topics. I also have a notebook in my backpack for those times when a computer isn’t near to jot stuff down in. Everything from grocery lists, to blog topics. Lastly, I use my iPhone where I have a page of notes that are blog topics. No, you don’t have to have as many places as I do, but I know those are the spots I look for when I have time. Not all ideas make it to a full blog post, some get crossed out, others get folded into each other. It’s the brainstorm phase of writing….just like we teach kids. 4. Find a blogging interface that works for you. In the end….I think it’s about finding your flow. Some people blog at the same time every day. I know Kim Cofino (cause we talk about this kind of stuff in the office) does most of her blogging on the weekend, because that’s what works for her. I found that I need it cool, I blog better, ideas flow when I’m in a cooler temperature. So I either blog in my home office with the A/C on or here on the couch with a fan blowing on me to keep me cool. I didn’t realize this was an issue for a long time here in Bangkok. It’s only been about 6 months that I realize I don’t write because I’m uncomfortable, hot, sticky, and not in a thinking mode. Find your flow, find which time/day works for you, what place, which application. Take time to try things out. I’m constantly looking for another blogging application to replace ScribeFire and just haven’t found one that I like better…that enhances my flow of ideas and process of writing. Utecht’s post began after a great discussion he had in a course around “how blogging was going for those in the class. All of them just 5 weeks into blogging. It was interesting to hear that many of them say blogging as publishing. That they had a lot of drafts waiting to be published but they wanted them to be “perfect” or “publishable”.” This is also one of my weaknesses when it comes to blogging. Because I also view blogging in a more formal way, as publishing, the creation of my posts is incredibly time consuming and tiring. 1) Writing flows from a moment captured by the voyager; I am he. 2) I write to transform my experiences. “Often I sit down at a computer and, unbidden, like a spring flowing, the words begin to come. In fact, that is the mental image I have of writing–a flowing spring, a well in the desert. Sometimes, that well is empty and dry, but the waters of the spring lurk beneath the sand and grit of everyday, endure beneath the searing sun. So beautiful. 3) Dare to contribute for you are beautiful as well. “I still encounter that feeling of despondency, of writing in spite of great thinkers. “Yes, I recognize your greatness,” my writing proclaims, “but while your song may be beautiful, so is mine…because it is I who sing it.” So, to be a successful blogger, you have to tap into who you are, and mean or nice, share who you are.” Love. 4) It doesn’t matter what you write about, just tell the truth. I loved this one! “I recently shared a cartoon that reads, “I have nothing to say…I say it regularly.” But that’s not true . What is true is that I have to share as much of the truth as I can tolerate, and then push it a bit. There are many things happening in the world today, much in our lives to be grateful for. And, there are also many things that try to sap the joy out of life. To deny either life, the priviledge of honesty, of transparency, of truth diminishes us. So, while I am not wise enough to be a soothsayer, I can strive to tell the truth in the hope that I may someday grow wise, or failing that, learn more. Blogging is about relationships, and I cannot imagine being less than truthful as possible. Yet, a million times, I am grateful for your forgiveness. When I read what others have to write–and I read quite a bit, but shallowly like a rock skipping over the surface–I am compelled to write about my point of view on those experiences. While someone may be particularly erudite (there, you see? That’s the defiance, the thought I can do as well as the erudite author), I know that it does not represent the whole story…because I am a part of that story. It is important to speak truth to the universe, to tell it the truth about itself (if you can identify the title of the sci-fi book that came from, let me know, ok?). In traditional publishing, it’s expected you be an expert before opening your mouth. Blogging academics…I think that’s just trying to elevate the account of wrestling with truth in our lives. Like “He Who Wrestles with God,” bloggers must wrestle with their ideas, their emotions, the world around them and bring order to it. We need to speak to that struggle, tell when we fail, when we succeed.” Beautiful. 5) Sharing one’s appreciation of neat things found in the world or in one’s heart. For the past week or so in my life, all roads have led to research on the importance of teaching the arts in education. There is a wealth of research and information out there that explains why teaching the arts in education is so important, along with free resources and tools for teachers to use to assist them in teaching the arts in education. 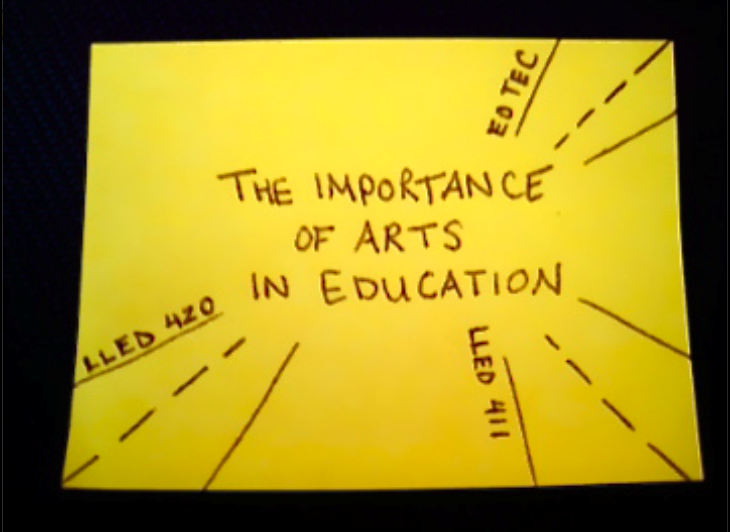 Also, in this post, I’d like to discuss not only the importance of teaching the arts in specialized classrooms for those arts, but also the importance in incorporating certain arts into regular classrooms such as English classrooms. Wilhelm wrote in reflecting on this experience, “The artwork considered in this study helped me as the teacher, and helped the students themselves, to see the various ways in which one text could be evoked and the various possibilities that it held to be read in different and potentially richer ways.” Lastly, Wilhelm wrote that, “The greatest recommendation for including artistic response in the language arts classroom is that it encouraged very different readers to respond in natural ways, to share that response with each other, and to extend and develop it in unforeseen, socially supported, and personally validating and exciting ways.” Wilhelm’s book “You Gotta BE the Book” contains a ton of creative teaching ideas and strategies, unique ways to incorporate the visual arts into the English classroom, the theory behind these ideas, and commentary to each chapter in which Wilhelm reflects on the research and insights he introduces. “You Gotta BE the Book,” is seriously worth reading for any educator, tutor, or teacher of reading or writing. Chun, C.W. (2009). Critical literacies and graphic novels for ELLs: Teaching Maus. Journal of Adolescent & Adult Literacy, 53(2), 144–153. Teaching graphic novels can be an alternative to traditional literacy pedagogy, which ignores the dynamic relationships of visual images to the written word. The multimodalities of graphic novels such as Maus and Persepolis, along with their engaging content reflecting the diverse identities present in many classrooms, work in tandem to help deepen students’ reading engagement and develop their critical literacies. Making connections between these stories and students’ own experiences, and drawing on their outside multiliteracies practices aid literacy development. Guthrie, J.T. (2004). Teaching for literacy engagement. Journal of Literacy Research, 36(1), 1–30. Students’ engaged reading is “often socially interactive” (p. 4). These interactions are clearly evident in the reading club, chat room, blog, and posting activities that have flourished in the wake of recent phenomenally popular books among adolescent and adult readers. Students’ increased engagement with particular genres (in this case, graphic novels) can facilitate their entry and apprenticeship into important social networks that amplify opportunities for academic success in mainstream classes. Thanks to the English Ning, I found through Frank W. Baker’s post an amazing cite through Ovation TV that offers and Arts Ed Toolkit containing “curriculum units [that] have been designed in collaboration with New York City Department of Education and are available for download. The materials are suitable for grades 9 through 12 and include documentaries, films and complementary curriculum units, in alignment with the National Visual Arts Standards, as outlined by the National Art Education Association, as well as other activity guides. They are applicable to various other disciplines including language arts, social studies and beyond.” And all of this is completely FREE! In less than a minute all of the material was at my fingertips!